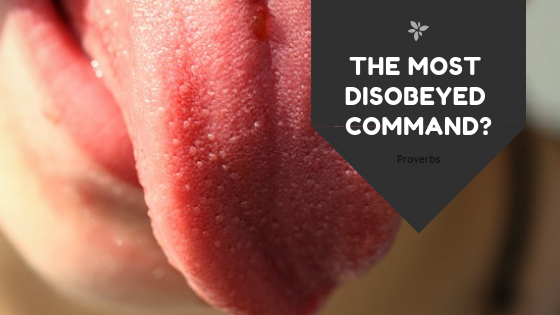 What do you think maybe the most disobeyed commandment in the Bible? Automatically your mind is probably frantically trying to remember the big 10 from Exodus 20 and whilst this is applaudable we need to remember that these aren’t the only commandments in the Bible. with this Solomon is arguing with the popular meme of today that says “Sticks and stones will break my bones, but words will never hurt me,”. Solomon says “that’s not true, words do hurt. Words can become weapons”. We often use our words to express anger, irritation, disappointment, stress or whatever negative emotion we may feel needs to be vented at the time … usually, and most tragically, those who are closest to us often feel the thrust of the sword in the most painful way. It’s been said that the lowest form of wit is sarcasm but did you know that the root of our word sarcasm comes from the idea of cutting flesh. Sarcasm isn’t comedy if it’s directed towards someone. Did you notice those three commands? Be quick to listen, slow to speak and slow to anger. Maybe these are the most frequently disobeyed commands in the whole Bible. What do you think? I agree that is frequently disobeyed, especially with a tongue like mine. When I first read the heading – I thought of no 1 too…. I cannot go 5 minutes without breaking that command – but also feel that I do not listen enough, talk too much and not always careful about what I say!! So very challenging!